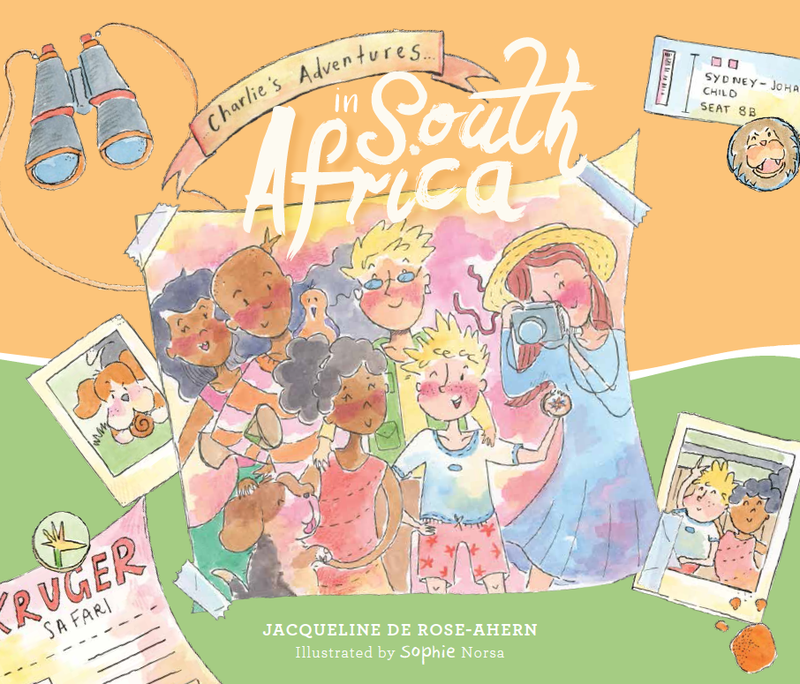 Charlie’s Adventures…in South Africa, Jacqueline de Rose-Ahern (author), Sophie Norsa (illus. ), Little Steps Publishing, August 2018. Charlie is off on the second of his adventures with his family… to South Africa. Being an ex-South African myself, I was immediately excited with the opportunity to revisit this amazing place so close to my heart. 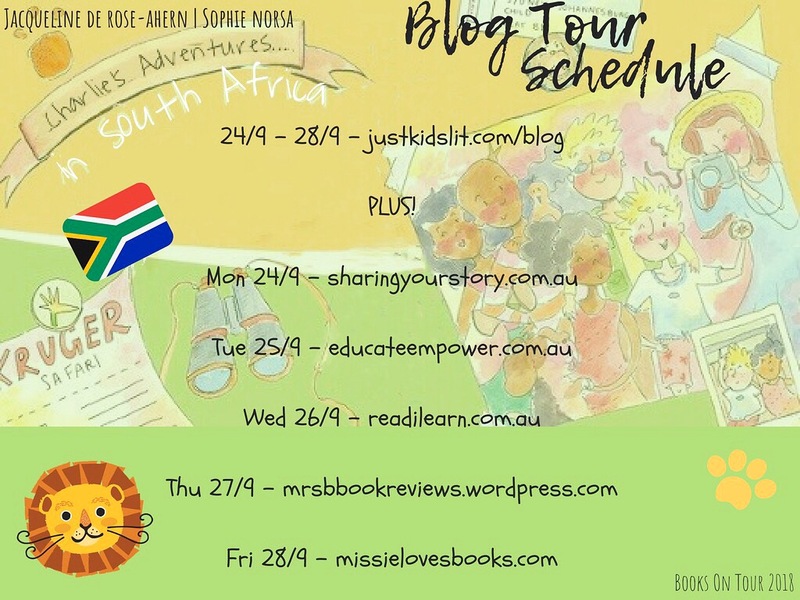 Upon reading Charlie’s Adventures… in South Africa, I was not disappointed with the cultural ambience and vivacity highlighted by popular national landmarks, stunning landscapes and the book’s sense of exploration and discovery. Jacqueline de Rose-Ahern beautifully captures the essence of the country’s way of life and particular nuances that make it so unique. I loved exploring all the special features of language and dialect, native animals, historical figures, iconic landmarks and customs, particularly with my children who wondered about my hometown all the way across the ocean. Accented with Sophie Norsa’s vibrant and colourful watercolour illustrations, Charlie and his family set out, with map in hand, to find clues that lead to a national treasure. Beginning in Johannesburg, their friends greet them with a ‘Howzit?’, and are then led on a safari to encounter the Big Five, ablazed with a glorious red and orange sky. With each ‘colour-inspired’ clue and destination, hints are hidden within the pictures to help us ponder the result of the mysterious treasure. Words around the yellow flowers, Mandela’s Gold (named after South African leader Nelson Mandela) include ‘Democracy’, ‘Diversity’, and ‘Respect’. Green and purple Jacaranda trees line the magnificent Table Mountain (in Cape Town), and at a braai (barbeque) the children dance to African drums in their blue and pink boots. With the most joyous finale, Charlie discovers that diversity, hope and unity are represented within South Africa’s ‘Rainbow Nation’. The beauty of Charlie’s Adventures is that readers can choose a destination they want to explore in isolation, but at the same time would benefit from completing both adventures in Jacqueline’s marvellous series. The first title, ‘…in Hawaii’ comes complete with a pull-out map to mark Charlie’s visits. ‘Charlie’s Adventures…in South Africa’ includes a postcard and sticker to add to your collection. What a ‘lekker’ concept! (That means ‘great’!). What joy, worldly knowledge, cultural and inclusive awareness this book brings to its primary school aged readers! We’ll all be hanging out for Charlie’s next adventures!